While the PlayStation Store is littered with big-budget titles created by mega-corporations, there are also many micro-indie games. These lesser-known titles are often created by a single impassioned developer, or a small team. 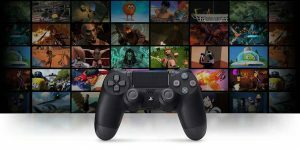 Many indie games are only available in the PlayStation Store because someone refused to give up, hustled for money when things got tough, scrimped and saved and made sacrifices in their personal lives to attempt to push their game across the finish line. 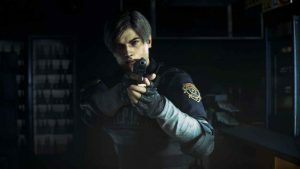 For every indie title to be found in the PlayStation Store, there is a person or team of people that poured their hearts and souls into making that game a reality. For local multiplayer party game BOMBFEST, releasing on PlayStation 4 on January 31, 2019 that person is Zac Pierce. 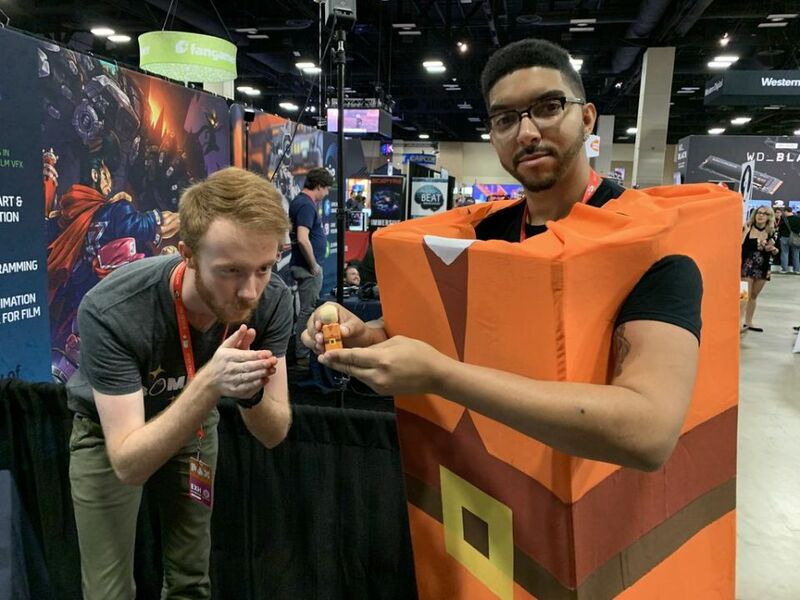 Zac Pierce (left) promotes BOMBFEST at Pax South. A 2015 graduate from the University of Akron, Pierce founded Sudden Event Studios directly out of college, and set about creating his first videogame. Originally titled “Well-Wishes”, BOMBFEST made a splash at the 2015 GDEX convention. Pierce was awarded with a Unity 5 license, and taking some advice from the awards panel to focus on the bombs in his game, began refining Well-Wishes into BOMBFEST. We played a near complete version of BOMBFEST at GDEX 2018, and found it to be one of the most fun competitive multiplayer games at the show. There was a constant crowd gathered around BOMBFEST’s booth, as the elegant simplicity of the game made it easy to grasp and fun to watch. 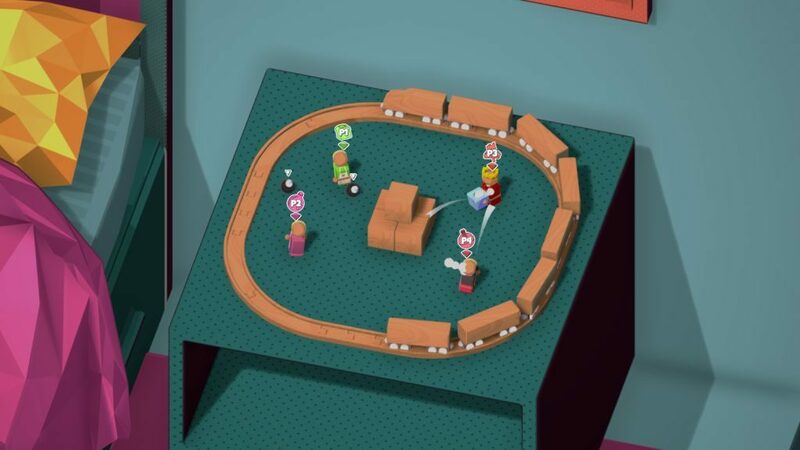 In BOMBFEST, four players start in a small arena, all self-contained on one screen. Then the game starts dropping bombs among the players, and chaos ensues. Players can pick up the bombs and toss them at their opponents. It is possible to “cook” a bomb, holding it until the last possible second, then hurling it at a crowd, leaving them no time to dodge out of the way. Getting blasted by a bomb sends players’ tiny wooden characters flying. Getting knocked out of the arena ends the player’s ability to win the round. It is amazing how such a simple looking game can make a crowd of grown people scream. But in a great twist, BOMBFEST respawns eliminated players as bombs, allowing them to continue to stalk and harass players still standing. Bombs can also trigger other bombs, allowing for great chain-reaction Worms-style coups. Many of the arenas also have inanimate objects scattered about that get thrown around by the explosions, shifting the playing field and contributing to the carnage. 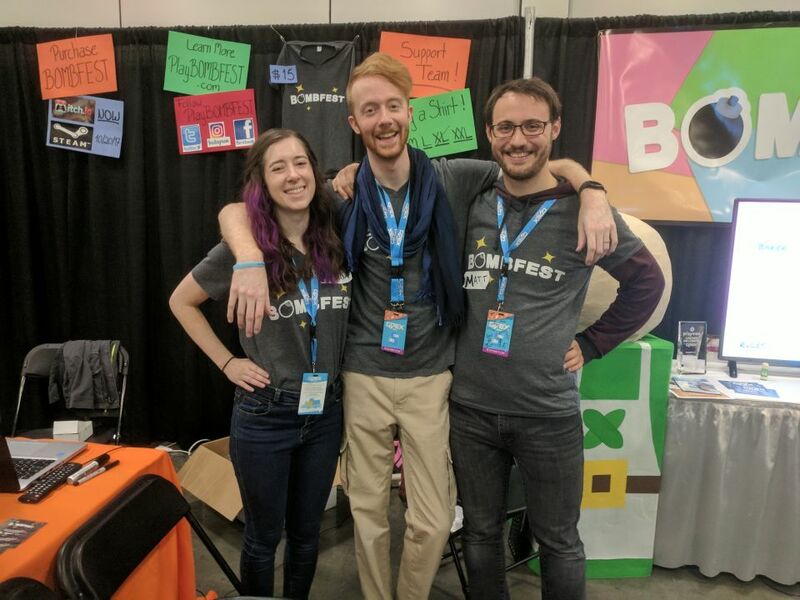 Paying for the development of BOMBFEST out of pocket, Pierce and his small team ran a Kickstarter in 2016, raising over $9000 to pay for BOMBFEST’s marketing budget. 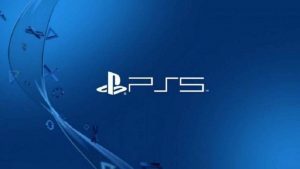 Since then, he has been working to complete the game and get it through the certification process at Sony. As he sprints across the finish line in the last week before the world-wide release of BOMBFEST, Zac Pierce took the time to answer some questions for PlayStation Universe. Please tell us a little bit about yourself and your history in the games industry. I’ve been making games ever since I was young, and I entered the industry back in college. After working through school, I took year off to pursue games professionally, and here I am 4 years later. Could you explain the concept of BOMBFEST for our readers that might not be familiar with the title? BOMBFEST is when sumo wrestling meets explosives! Use bombs to push your opponents around, and try to be the last toy standing. What features in BOMBFEST do you feel distinguish the game in a crowded marketplace? What makes BOMBFEST special? BOMBFEST features intuitive gameplay and very simple controls. It’s the perfect party game that’s fun to watch and even more fun to play! A variety of settings and objects change up the gameplay, necessitating new strategies. Unpredictable chain reactions destroy the best-laid plans. Could you give us a brief history of the game, from conception through development? What were some of the milestones along the way? 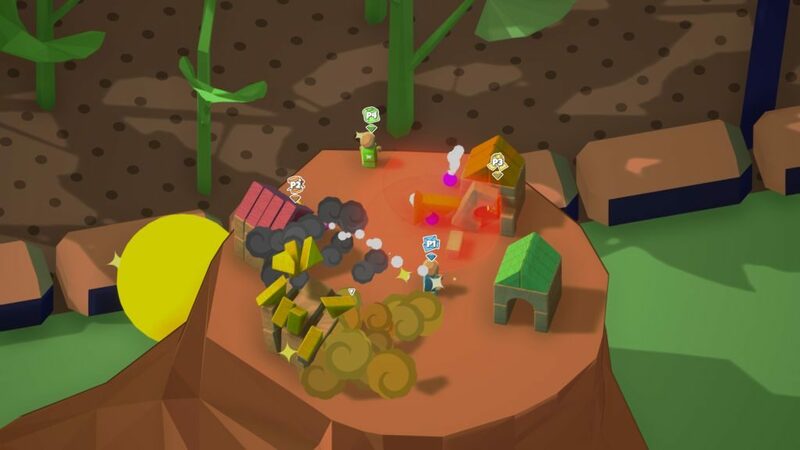 BOMBFEST used to be a game called Well-Wishes, a 4-player adventure game based around throwing money into a wishing well. I ended up winning a pitch competition with it, which netted me a free Unity Pro licence, as well as some invaluable feedback: the bombs are fun. I scrapped every other feature, renamed the game BOMBFEST, and the rest is history! What sort of team developed BOMBFEST? Are you a one-man show? Has the development of BOMBFEST been a full time job, or did you do it on the side? 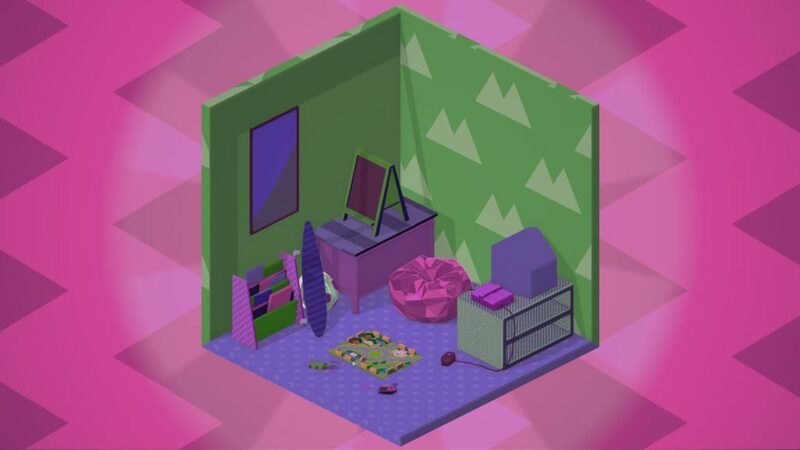 BOMBFEST was developed by a small team of talented individuals, including Marisa Hike, Matthew Trowbridge, Jennifer Virnelson, and Brian Freeland. Our publisher, Whitethorn Digital, has also contributed immensely to our console release efforts. BOMBFEST has been a full-time job for myself, with teaching and freelance on the side to help pay for development. Zac Pierce (center) poses at GDEX with 3D Artist Marisa Hike and Sound Effects Artist Matthew Trowbridge. 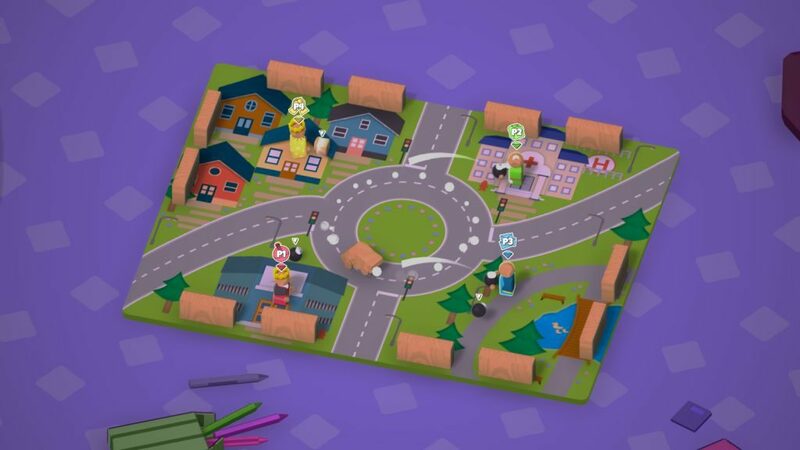 Looking at your Kickstarter for BOMBFEST, you raised $9,187 for the development of the game. $9000 seems like a modest sum for a game budget. Before the Kickstarter, Zac was funding the game out of pocket, and the Kickstarter funds were intended for things like marketing and press outreach. Were you able to stick to this plan? Absolutely. As soon as the Kickstarter funds came in, I wrote a check with the exact amount and handed it to marketing. I haven’t touched a penny of that budget, and development was entirely covered by my own life’s savings. It looks like BOMBFEST is releasing right on time, coming in on the predicted delivery date. What were some of the bumps in the road you encountered in the development of the game? Was the delivery date ever in doubt? Actually, BOMBFEST is releasing a little later than our original predicted launch date of January 8th. Getting the game through certification was an incredible undertaking, and ended up being more work and taking more time than originally anticipated. Across all of development, there were more road bumps than I care to think about, but we’re finally approaching the finish line. Were there any features that you wanted to include in BOMBFEST that you had to leave out, due to time or budget? We’ve got quite a list of features we would love to add to BOMBFEST, and with post-launch updates on the way, many of those features will be included in the game soon! It’s our pleasure to update the game with even more content, and to do it for free! The BOMBFEST team is looking to add new levels and skins as free add-ons post-release. Are there any plans for BOMBFEST post-release? Are there any features or levels that you are considering releasing? Free updates are already in development, and we can’t wait to get new features into the hands of our players. We’ve already got 3 new bombs, a new stage, and a handful of new skins on the way, with more planned for the future! What does the future hold for Sudden Event Studios? Do you have more projects in the works? We’re hopeful that the success of BOMBFEST will allow us to pursue more creative and exciting games in the future. We have a handful of prototypes in the works, and we hope to make a few into fully-fledged games. Any final words for our readers about BOMBFEST? Anything you feel we need to know? BOMBFEST releases on January 31st on all major platforms; don’t miss this game! If you’re interested in game development, or you’d like to interact with me more directly, consider stopping in one of our development live streams over on Twitch! You can find me as ZacFierceGuy. Thanks to Zac Pierce and the team at Sudden Event Games for their participation in this article.